I learned an important lesson on Saturday morning — When it is 12 degrees outside, your phone might get “cold” and shut down in the middle of a Facebook Live broadcast 🙂 It never crossed my mind that would happen. I’m used to working in the cold — I just assumed that my phone would be too! Tagged as Beef, Cattle, different types of animals, Facebook Live, factory farms, family farm, Feed yard, feedlot, where does my beef come from, Who raises my beef? Despite their remarks that summer has gone too fast, my girls head back to school on Wednesday. They’ve been on vacation for three months, but I have to admit that it seems like last week when we transitioned from school to the swim team season. And doing other farm chores…. And welcoming a new puppy into our family! I’m not sure exactly what the girls had in mind for their last day of summer, but their Mama decided to finish out the vacation with a Facebook Live broadcast from Roberts Cattle Company to visit our cattle at the feed yard. I tell my girls that the road to excellence isn’t comfortable, so it seems appropriate to finish up the summer pushing my comfortable limits and forging into new territory. I’ve never done a Facebook Live broadcast, but I think that it is a great way to increase transparency and allow folks to have insight into life at a cattle feed yard. I would ask that you all support me in this new endeavor by both sharing the news of the broadcast and getting online to participate in it. It will be at 7:30am central time tomorrow (Tuesday) morning. Just hop onto Facebook to the FeedYard Foodie page to watch. I plan for the broadcast to go approximately 10 minutes, so you can hang out with Karyn, Megan and I (along with our bovines) as you enjoy your morning coffee! Please feel free to ask questions during the broadcast, or you can leave them here in the comment section of this blog prior to tomorrow morning. Have you ever wondered about the story of where your beef comes from? 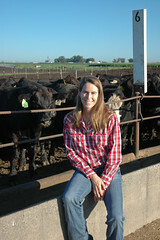 Do you want to know about life in a Nebraska feedlot? Are you looking for a way to start your day with a smile? I traded dirt roads for the Denver pavement this week in order to participate in the MBA Top of the Class Training. While most folks think of an MBA as a business degree, in my world, the letters represent Masters of Beef Advocacy. Sponsored by the farmer funded Beef Check Off, the MBA program exists to inspire farmers and other beef advocates to share their story. The core information learned in the MBA program creates a basis of necessary knowledge and skills to begin the advocacy journey. The Top of the Class Training consists of a two day intensive seminar which enables MBA graduates to find a higher gear on their journey. 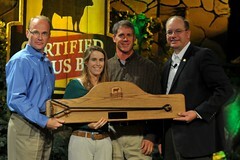 Top of the Class graduates are “super advocates” who consistently channel their passion in order to share the story of beef. I was invited to provide the Keynote Address as well as mentor other bloggers in one on one learning sessions during the two day event. The topic of my Keynote Address was “The Evolving Journey of a Beef Advocate”, and preparing the power point presentation for the speech was a bit like traveling down memory lane. My advocacy journey began with public speaking events and routine media interviews in 2006. It eventually lead me to creating this blog in 2011. I became a farmer because I fell in love. I became a farmer advocate because when you believe in something, you want to share it. After more than a decade, I remain an advocate because I believe that the stability of our country is intrinsically tied to the availability of food. A plentiful and safe supply of food relies heavily on eliminating the knowledge gap between the 98% of the population that consumes food and the 2% of the population that not only consumes it but also grows it. Farmers need to share their story. Others outside of agriculture need to engage and listen. Together we create a meaningful dialog that leaves all of us smarter and ultimately protects the livelihood of our country. Feed Yard Foodie is not just “Anne’s Story” — Feed Yard Foodie is a piece of Anne. I sustain in my advocacy journey by remaining true to my core values and creating a revolving fountain of energy through the personal growth that I gain from living on a farm and writing about those experiences. I tell my girls to always pack their FAITH. A few years ago, I heard another feed yard manager talk about the importance of the feed yard crew employing an appropriate sense of urgency to individual situations on the farm. I’ve held onto that phrase in my head because I think that it holds the crux of successful animal care. Personal reactions to farm events determine the effectiveness of their control — whether you are the boss/ foreman or the water tank cleaning crew. We run a “short crew” on Sundays at the feed yard. My three guys take turns feeding on Sundays having to work every third weekend. It is a nice way to ensure that the crew gets some family time despite the long hours of work on the farm. We really can’t get the work load finished on Sunday mornings with just one person, so I am a permanent Sunday morning crew member. I read bunks, check water tanks, observe cattle health, and generally do whatever needs done while my other crew member drives the feed truck delivering breakfast. Most Sundays, it works like a charm. This week, I arrived at the feed yard just before 6:00 to start chores. My cowboy met me at the front gate with the unfortunate news that our main well had gone down and all of our water tanks were empty. Water is critical — our animals have to have it — having a well problem on a Sunday morning is a BIG DEAL. This Sunday was not my “cowboy’s weekend” — it was his day off. However, he had stopped by the feed yard on his way to town for breakfast just to make sure that everything was okay. The feed yard has a back up well, so we fiddled around in the dark and got it started. The problem with the back up well is that it is not as powerful — it’s primary job is to supply extra water to cattle in the summer, not to provide the total water supply. We’ve never had this problem before (showing up on Sunday morning to find water tanks dry), so Rich and I debated how long we thought it would take for the back up well to refill the water tanks. I really hate to bother my foreman on the Sunday morning that is supposed to be his day off. However, it seemed an appropriate sense of urgency to call him as I was unsure if the secondary well would provide enough water. I am sure that he was really excited to hear my friendly voice on his cell phone at 6:30am on his “off” Sunday; but he’s a dedicated animal caregiver and was out at the feed yard within 20 minutes. The secondary well did an awesome job and had water tanks refilled in about an hour and a half. Our local well repair company came out Monday to install a new pressure switch on the main well — and the 1700 bovines on the farm remained well cared for throughout the entire episode. Times like this remind me of the importance of the loyalty, integrity, and compassion of my crew. My cowboy and my foreman are a rare breed of men — always putting responsibility to the animals ahead of personal agendas. I have been blessed to have them on the feed yard crew for my entire tenure on the farm and I am very proud of our high level of teammanship. As we transition the farm, they will both begin to play a new role but Matt and I are very thankful that they will remain members of our farm team. I think that it is impossible to pour your heart and soul into a business for 2 decades and not leave some sort of a *mark*. The running joke at the feed yard revolves around what my favorite farmer affectionately calls Anne Gates. When I look back on the last 20 years as a beef farmer, my mind recalls many Anne gates — some of which are not physical passageways, but rather metaphorical bridges from my farm to the outside world. This blog is one of them. In 2016, agriculture in the United States faces many challenges. Quite likely the greatest comes from a lack of effective gates from the farm to the dinner plate. Less than 2% of Americans work as farmers, and most of our urban counterparts are more than two generations removed from the farm. Understanding where your food comes from is no easy task, and finding good information on it resembles the old adage of finding a needle in a hay stack. Raising cattle takes a unique set of resources as well as a relatively long period of time. Beef farming epitomizes the newly popular slow food movement as breeding cattle live more than a decade, and cattle raised solely for the production of beef thrive for close to 2 years — grazing grass pastures and then spending a few months in a feed yard at the end of their lifetime. Doing it right takes dedication, patience, and a whole lot of hard work. One of the things that I have attempted to convey with Feed Yard Foodie is the complexity of caring for cattle and growing beef. The gate of transparency challenges farmers, and figuring out how to explain daily animal care and business decisions to those that live outside of the farm is hard. I struggle with this, and I know that I am not alone. While I am closing the gate to my feed yard in about six months, I do not plan to “close the gate” to this blog. It is an Anne gate that I am keeping until I both run out of things to say and run out of things to learn…Many thanks all of you for taking the journey with me. When Virginia and Rachel’s cattle leave the home ranch, they travel approximately thirty miles to my farm. The cattle make the trip in large stock trailers pulled by pick up trucks driven by the family. Shipment day is a busy one, and the cattle arrive at the feed yard about noon. The goal is to minimize the total stress on the calves so we all work together to make the logistics flow seamlessly. Learning to become comfortable with a new set of human caregivers. Learning to exit the home pen in an organized fashion and move confidently down to the corral. Learning to attribute comfort to the home pen — understanding that fresh feed, water, and a comfortable place to both play and rest can be found there. I believe that this process is a critical component to reducing stress on newly arrived cattle and allows them to settle in quickly and seamlessly to their new home. We run the feed yard to set our animals up for success — recognizing that it is our job as caregivers to strive to attain the 5 Freedoms of Cattle Care while also working to be sustainable environmental stewards to the resources on our farm. As a member of the Beef Marketing Group Cooperative, my feed yard is certified under the QSA of Progressive Beef. As such, we have Cattle Care Guidelines and Standard Operating Producers that dictate the daily care practices for our animals. 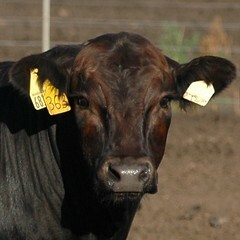 We work with our veterinarian and bovine nutritionist to ensure that our care is appropriate and effective. We are audited twice a year to ensure that we follow through on the details relative to this care. One of our two Progressive Beef audits in 2016 is an “unscheduled” audit — this means that we do not know what day the auditor will arrive to check both the physical aspects of our feed yard care and our supporting paperwork. Tuesday morning, I left the feed yard and headed to the dentist at 8:00am. I was on the road headed back to town when I got a text message saying that the Progressive Beef auditor was 45 minutes away from the feed yard. Although an audit disrupts the daily routine at the feed yard, I view it as both a learning process and a way that I can assure the folks who purchase my beef that it was raised responsibly. An audit is very much like a report card, and the metrics involved play a key role in our path of continuous improvement. At the end of the video that I put up last week, I asked for trust from you for me as a farmer. I recognize that this is a big ask on my part, and as a result I open my farm to auditing so that I can verify my actions and reward your trust. Stay tuned for next’s week post that takes us from the feed yard to the packing plant — among other things, we will learn the importance of the small white button in the above calf’s ear! It has been a bit surreal these past few weeks blogging about Ecuador and the Galapagos while working on the farm in Nebraska. The view from the prairie is a bit different! So, you might ask “What is January like on the Feed Yard Foodie farm?”. Over the past few weeks, my crew and I have been busy feeding, performing our daily cattle health check, shipping cattle to Tyson, and getting new animals into the feed yard. This time of year, the new animals come from ranches close by that wean their calves at home and “background” feed them for approximately 60 days before shipping them to us. Background feeding is a term often used in the cattle world. In the plains states, we must feed our animals during the winter months as Mother Nature does not provide much in the way of plant growth. Many of my animals are weaned on the home ranch and placed into large pens (or pastures with feed bunks) on the ranch where the animals are fed a casserole of feed that is a blend of forage and corn products. This allows for the animals to continue to grow on the home ranch and make a smooth transition to the feed yard in January and February. Most ranchers with spring calving cows (cows that give birth February – April) wean their calves in October in order to give the mama cow the ability to focus on the calf in her belly during the last 5-6 months of gestation. The mama cows are grazed for the winter on corn stalks with a supplemental feed of alfalfa or wet distillers grains, and the calves are fed separately from their mamas. Over the past few weeks, more than 500 new animals now call our farm home having traveled less than 30 miles from the ranch where they were born and backgrounded. Backgrounded calves have an seamless transition coming into the feed yard as the casserole fed on the home ranch is very similar to the receiving rations (casseroles) that we use at the feed yard. I have partnered with these ranchers for many years as we work together to raise cattle, and am very proud of the teamwork that goes into the healthy and delicious beef that we grow together. These steers (pictured above) are almost a year old and weigh 860#. They will spend the next four months on my farm where they will gain an average of 4 pounds per day. When they leave my farm and make the 20 mile trip to Tyson Fresh Meats, they will weigh close to 1400#. That’s a lot of great tasting beef! One of the things that I love most about our farm is it’s combination of quiet beauty and practical usefulness.